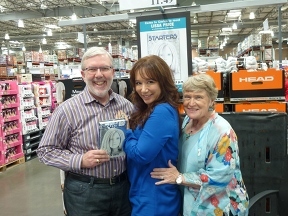 My dear family friends Alice and Leonard Maltin, the multi-published author and noted film critic, came out to see me at Costco LA on their way to a Book Soup gig. Many other wonderful friends also came out to support me, which was wonderful and so strange to see them in the midst of stacks of socks and sunscreen. I had some terrific angels who helped, and the store contact had it so together, with my table nicely set up with books and signage and anything I needed (let’s face it, Costco has it all). I was tickled that STARTERS gained a lot of new readers that otherwise wouldn’t have known about it. What a thrill to see a wide range of people that I wouldn’t think of as my target readers get the book on impulse. A teen who bought it was later seen strolling with her mother in the store reading it while walking – she couldn’t wait to get out of the store. I got a very special visit from a blind teen – very smart guy – whose mom brought him and will probably read it with him. Since I originally got the idea for the book at Costco, it really felt like coming full circle to be there. I did a special sketch in the books that people bought and passed out swag. The time flew by, so before I knew it, my two hours were up and my friends were hungry. So I signed the extra stock, signature only. If you didn’t make it to the signing, there are a few of those left. Later tonight, I’ll pick two winners of giveaway prizes (a mouse pad and a water bottle with the cover on them). The best part was when the store contact came back near the end and saw how many books were gone. He said this was the best signing he’s had. I’m sure he meant best of the non-famous people that they’ve had, best if you don’t count the celebrity chefs and big baseball stars and that captain that saved a planeful of people. But I’ll take it. Thanks from the bottom of my heart to everyone who helped support me and make this such a fun day. Next month, Westlake Village (and that will be the last Costco signing). Glad to hear it was a lovely signing. You got the idea for the book while in Costco? That’s a story I’ve got to hear. That’s great! I wish I lived closer I so would have came out to see you but alas no one ever comes near where I live. Sigh another downside of living in a small town. So I’m there in spirit! Wow, you had Movie royalty! I wish I, too, lived closer. I’m so excited that you had a great time at your signing. They are so fun! My friends who happened to be there at the time got the pleasure of meeting Leonard, who is the world’s nicest man. His movie guides are the best ever.